This Korean Stlye Tako Poke refers to a Hawaiian delicacy made of octopus and condiments of limu (seaweed), Hawaiian sea salt, chiles and ‘inamona (roasted kukui nut paste). 1/2 kg tako (Tako is the Japanese word for octopus) – To prepare the fresh tako for cooking, Turn the head of a fresh tako inside out, clean and rinse; then cut away the eyes and beak. 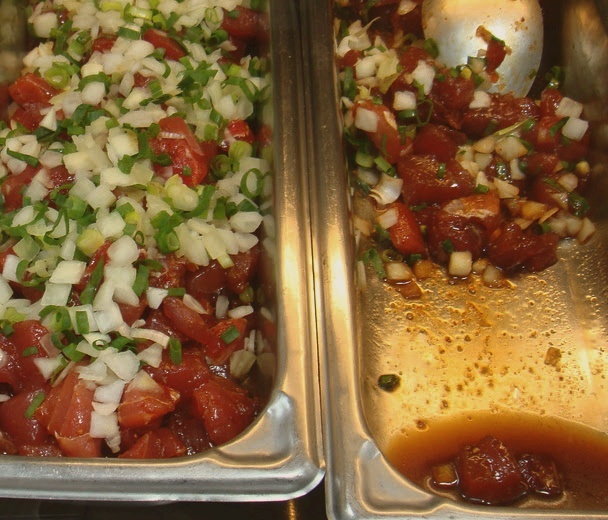 Tenderize the tako by freezing, with Hawaiian salt, or by pounding with a dowel, 2-by-4 or other object. Or cut half a potato up and put it in a pot along with the tako as it boils to make it tender. 2 tablespoons bottled Korean kochu jang (hot chile paste), available in your Asian supermarkets. Cut ogo in 2-inch lengths. Cook tako as instructed and slice. In a mixing bowl, combine all ingredients. Serve very cold at your family or holiday gatherings.